Finally! A winning streak. Granted, it’s only two games, but you’ve got to start somewhere. Mike Pelfrey was brilliant for the third consecutive start, delivering seven shutout innings in the Mets’ 4-0 win over the Cubs. Jose Reyes showed signs of life, notching four hits, including a two-run triple in the second that gave Pelf all the support he needed. Fernando Tatis, who has been pretty bad to this point, also came through with a two-run pinch-hit homer in the eighth for some breathing room. Both of the big hits came with two outs and runners in scoring position, situations the Mets have whiffed on time and again over the last few years. Ike Davis had a relatively quiet second night in the bigs, going 0-for-3. He did walk and score ahead of Tatis’ homer. The Mets’ middle of the order continued to struggle, with David Wright, Jason Bay and Jeff Francoeur all taking 0-fers. Francoeur has plummeted back to earth of late, seeing his batting average drop more than 100 points in the last five days or so. He’ll be fine, you knew he was going to hit .400, so no big deal. Wright concerns me though, he looks absolutely lost at the plate. Maybe a day off would do him some good, seemed to work for Reyes, who had the night off last night. The Mets go for their first series win of the year tomorrow in Game 3 of this four-game set. Wednesday’s game pits two guys who were absolutely horrible last year, yet have managed a pair of decent starts to kick off 2010 – Cubs righty Carlos Silva against the $36 million walk machine, Oliver Perez. 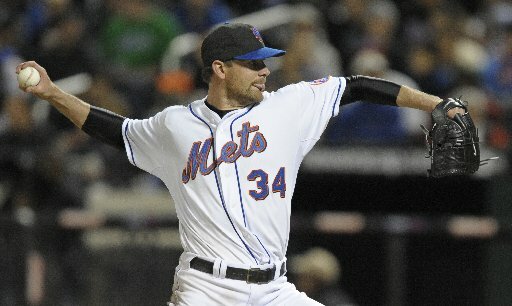 Ollie had his best start in two years last Friday, carrying a shutout into the seventh of an eventual 4-3 Mets loss. Good news for the rest of the NL East…the Phillies blew one big time today and seem to have some serious bullpen problems. Their offense masked some of these woes early on, but they’ve cooled off a bit (they’ll eventually heat back up of course). The last-place Mets, 6-8, are now 2 1/2 games back of the first-place Phillies and Braves. I know it’s a bit early to talk about the divisional race, but the Mets were five games back a few days ago, and have looked better this week. Of course, much of that (dis)credit has to go to the Cubs, who were struggling just as much as the Mets were.